We define global history as an ‘approach’ that seeks to analyse the process of globalisation, which requires the assessment of different scales of integration, contacts, and exchanges that transcend and by-pass local or national borders and have an impact on societies and states. As such, global history focuses on the channels through which connections between local and global perspective are made and unmade, but, ultimately, it also takes into consideration spaces that have resisted globalisation or remained ‘unglobalised’. Therefore, our volume identifies three channels that played a role in generating and sustaining anti-apartheid across the world: the global/local spaces in which this globalisation took place, the multi-layered concept of solidarity, and multilateral or specialised cultural networks, before considering the ‘globality’ of anti-apartheid itself. Our volume includes several new case studies of anti-apartheid networks operating outside of the Western world (Eastern Europe, Asia, Latin America). Still, while expanding the current understanding of the “geographies of solidarity”, this volume highlights the need to calibrate carefully any references to the movement as an embodiment of ‘the global’. Local and regional discontinuities, the divergent agendas of liberal, social democratic or socialist states, and geographical proximity to the apartheid state resulted in distinctive, sometimes contradictory, forms of anti-apartheid activity. 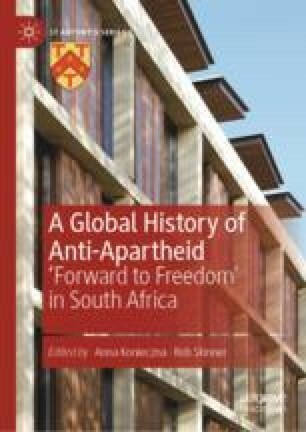 Further research, we claim, could indeed explore the role of identities, political cultures, states and diplomatic endeavours in bringing about the end of apartheid. This necessary caution should not, however, conceal and undermine the ways in which anti-apartheid activists imagined themselves as players in a global movement. Another global history of anti-apartheid could start by assessing those individual perceptions.